This Greek Frittata with Zucchini, Tomato, Feta, and Herbs is one of the Top Ten Most Popular Low-Carb Zucchini Recipes on Kalyn’s Kitchen. This will be delicious for breakfast, lunch, or dinner and this amazing breakfast is low-carb, Keto, low-glycemic, gluten-free, meatless, and South Beach Diet Phase One approved! Use the Diet-Type Index to find more recipes like this one. Click here to PIN Greek Frittata with Zucchini, Tomato, Feta, and Herbs! Watch the video to see if you’d like to make Greek Frittata with Zucchini, Tomato, Feta, and Herbs! If you’re lucky enough to have a vegetable garden or access to a good farmer’s market, you must realize that zucchini season is upon us! Zucchini is one of those ingredients that really gets my creative cooking energy going, and even though I’ve shared more than 50 Zucchini Recipes since I started this blog, it seems like every summer I have fun thinking of recipe ideas to use zucchini. This Greek Frittata with Zucchini, Tomatoes, Feta and Herbs is a recipe I first came up with in 2006 and I’m thrilled to finally have some photos that show how really delicious this frittata is! The recipe uses a generous amount of zucchini, canned tomatoes, and Mozzarella and Feta cheese, and when I made it with Jake for these updated photos we added some fresh chopped Greek oregano and fresh basil. No worries if you don’t have fresh herbs and garden zucchini, this will still be delicious with dried oregano and basil and zucchini from the store. I’d happily eat this tasty Greek Frittata for breakfast, lunch, or dinner and this recipe a perfect option for Meatless Monday. While tomatoes are draining in a colander, cut the zucchini into strips and then into 1/2 inch pieces. Heat the olive oil and saute the zucchini, garlic, and dried herbs. Then add the drained tomatoes and continue to cook until the liquid from the tomatoes is all evaporated. Beat the eggs, then pour eggs over the vegetables and cook until eggs are barely starting to set. Add half the cheese (and chopped fresh herbs if you have them) and stir gently, then cook the frittata a few minutes more. Sprinkle Frittata with a little more chopped fresh herbs if you have them and serve. This can make 4 large servings or six smaller ones. I love to eat it with a dollop of sour cream. This Greek Frittata with Zucchini, Tomato, Feta, and Herbs is one of the Top Ten Most Popular Low-Carb Zucchini Recipes on Kalyn’s Kitchen. Pour the tomatoes into a colander placed in the sink and let tomatoes drain well. Cut ends off the zucchini, then cut it lengthwise into strips and then into 1/2 inch pieces. Use a 10 or 12 inch heavy frying pan which can go under the broiler. Spray pan with nonstick spray if needed. Preheat broiler. Heat olive oil in pan, add zucchini, garlic, dried herbs, and Spike seasoning and saute 3 minutes. Add tomatoes and cook 3-5 minutes more, until liquid from tomatoes is nearly all evaporated. While vegetable mixture cooks, break eggs into bowl and beat well. 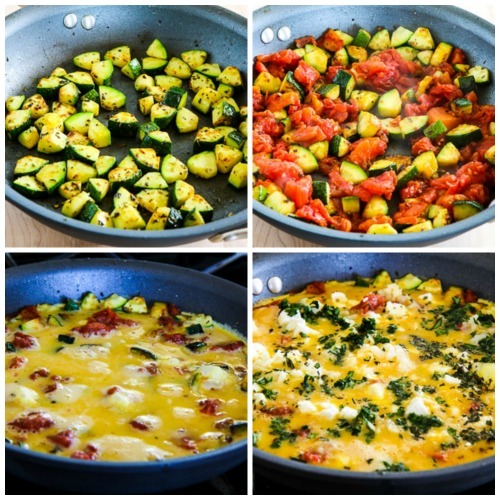 Pour eggs into pan with the zucchini and spices and cook 2-3 minutes, or until eggs are barely starting to set. Add half of Mozzarella cheese and Feta (and most of the chopped fresh herbs if you’re using them) and stir gently; then cook about 3 minutes more. Sprinkle the cooked frittata with the rest of the chopped fresh herbs (if using) and let it sit for a couple of minutes; then cut into pie shaped wedges to serve. This is good with a dollop of sour cream. This recipe is suitable for low-carb, Keto, and low-glycemic diet plans, which might recommend full fat-cheese. Feta is a lower-fat cheese, and it would be recommended to use low-fat mozzarella if making this for the South Beach Diet; other low-carb diets would probably refer full-fat cheese. I’d eat this for any phase of South Beach. This recipe was first posted as part of Weekend Breakfast Blogging at Saffron Trail, and I posted it when I was on my way to visit San Francisco. Anh at Food Lover’s Journey also wrote a nice post about my Greek Frittata. Yes, just cook a bit longer on the stove. It won’t look as nicely browned on top but will still taste good! Judith, so glad you enjoyed it! made it last night, yum yum yum! But i did not use the spike seasoning. No worries, Spike is completely optional! So glad you enjoyed it! Thanks for the nice feedback Samual! Yummy! Love the mix of veggies. Thanks for the great recipe. I am making this now. The instructions note to mix the eggs with the cream or milk, but I don't see cream/milk in the ingredient list. Oh duh, that's a mistake on my part. I used to always add a couple of tablespoons of cream or milk to the eggs, but the last few years I haven't been doing that. You can do it either way. I'll edit the recipe to take out that instruction. Looks good. Very different from the Greek frittata I make. It has potatoes, spinach and onion. Only feta in it. No mozza. You do such wonders with Greek flavors! This looks like another winner, for sure. Thanks Donna! I've been enjoying this for breakfast for years. I love the contrast with the new photos and old ones! This time, the beauty of the dish really comes through — and of course it is all of my favorite flavors. Lydia, I do love seeing the progress in the photography, thanks! heading to the kitchen wish me luck!!!! Arthur, good luck; hope you enjoy! No you don't really stir the mixture much once the eggs are added. This looks delish! I have a question. Do I stir the mix after I add the eggs, as I do when making scrambled eggs? Or, do I just let it sit and cook. This sounds like a great dish since it really could be eaten for breakfast, lunch or dinner! Just made this for dinner. Quite tasty! Thanks Dara. I am excited to try this with fresh tomatoes when I get some. I can see why this has been a favorite for so many years. The flavors are so fresh…perfect for summertime. Hyosun, so glad you like it! I usually make frittata for weekend brunch. You're right. This can be a quick meal during the week as well. The Greek version will be a nice change. Thank you for the great recipe again! Grace, hello! So great to hear from you. I am off to write you an e-mail right now. Kalyn, Looking for wondrous friends from the past and found this. Can't wait to try the recipe! Glad to see you still have a garden–and a passion! Lydia, I love Greek Seasoning and agree it would be great in this! I love this combination of flavors, and it's just the type of dish I'd nibble on throughout the week, too. Greek seasoning blend might be a great addition here in place of the oregano. It sometimes includes dried lemon peel, which could be interesting. It's a 14.5 oz. can of tomatoes (duh!) Sorry about that; I will edit right now and add that info. How big is the can of chopped tomatos? Kalyn, I think “Greek inspired” would be a more apt title of this dish. Delish indeed but not Greek in any regional dish sense or as something one would come across in Greece. Anonymous, thanks for the feedback. Glad to hear you liked it. This was so good!~ Both my husband and I loved it!! This was so good, I made it tonight and both DH and I loved it. Hey interesting site my friend. Keep on bloggin in the free world. Feel free to drop by my blog anytime. I will definitely try this one. It looks fabulous. 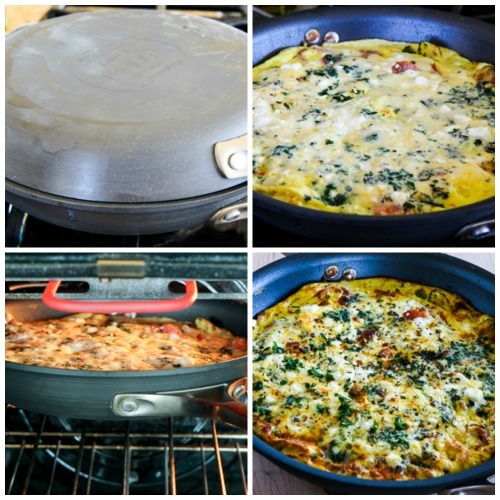 It seems that frittata’s are always our go to meal for Sunday lounging around day. I will definitely try yours. Enjoy the big city!!! I’m sure you will have tons to tells us upon your return. I have to make your frittata!!! I just love egg and cheese!!! Hope you have a wonderful visit in SF. Tanna, Genie, Joey and Bea, thanks, and I promise it was delicious. As for SF, I will promise to have fun. Sam, thanks. I am only going to be in SF until Sunday night. I thought about trying to meet up with you and some of the other SF bloggers, but since I’m coming with two friends who are not bloggers, and not even foodies I decided I better not. It is only 4 pm here and this makes me hungry!!! JUst the type of food I love! As a big fan of eggs this sounds wonderful to me 🙂 Have fun in SF! Kalyn! you are coming to SF? Will you still be here on Monday evening? Clotilde from Chocolate & Zucchinni is doing a big meet up, and are if you are still around you should most defintely join us. Check her blog for more details. Kalyn, this looks really yummy. 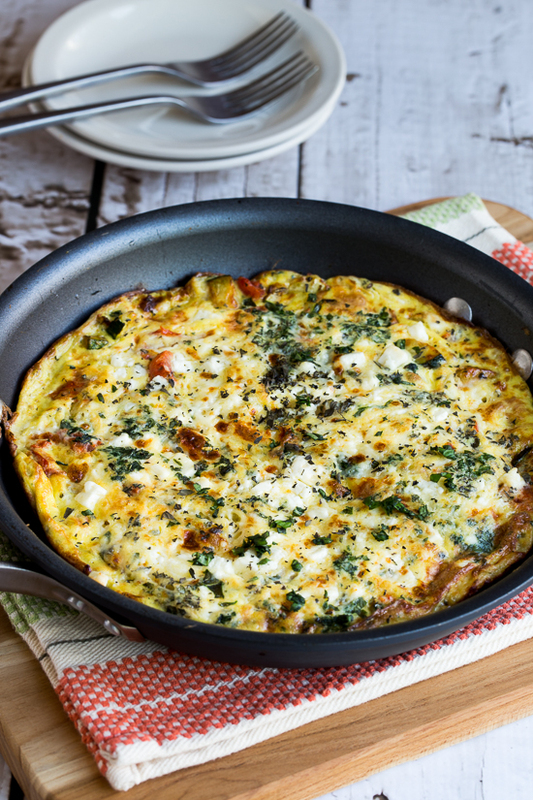 I have to try this — I’m a sucker for a good frittata, and I love feta cheese with eggs. Thanks for posting this, and have a great trip! Oh, yeah, that looks really great. Wonderful pictures! Enjoy San Fran. Such a tough place to have to visit!